Bangwe has 90% or more of its surface covered in an ocean of water. The system supports a population of fewer than 10,000 sophonts. It is a member of Third Imperium in the Antra Subsector of Deneb Sector and in the Domain of Deneb. Bangwe, as a member world of the Third Imperium, holds the estate of an Imperial knight, a member of the Imperial Nobility charged with overseeing the world. Bangwe system has a population between 10 and 100 million sophonts. It is a member of Wilds in the Antra Subsector of Deneb Sector. Bangwe, as a member world of the Third Imperium has a member of the Imperial Nobility overseeing the world. Bangwe's entire population lives on a single small chain of islands near the downport. The starport itself is a highly informal affair: a group of beacons ringing a shallow lagoon, with ships making a "soft" landing in the water. The locals subsist on fishing and handicrafts, and are quite content with their lot. In antebellum times the world attracted sportsmen from across Deneb, and locals make additional income by hiring themselves out to visiting RQS crews as guides and outfitters. Handmade, wooden catamarans and outriggers are the most popular form of transport, and some of these are exported to worlds safeside for exorbitant prices. Bangwe is one of three worlds chosen as wildside trade terminals, and negotiations are underway to expand the starport into a full facility for trade and colonization. The locals are reluctant to fully open up their world to contact, and are reportedly driving a hard bargain, in the form of higher recompense from the Regency government, before they will consent to any kind of widescale development. Gary L. Thomas, Joe Fugate. "Data/Library: Deneb." The Travellers' Digest 19 (1990): 24-30. Rob Caswell. 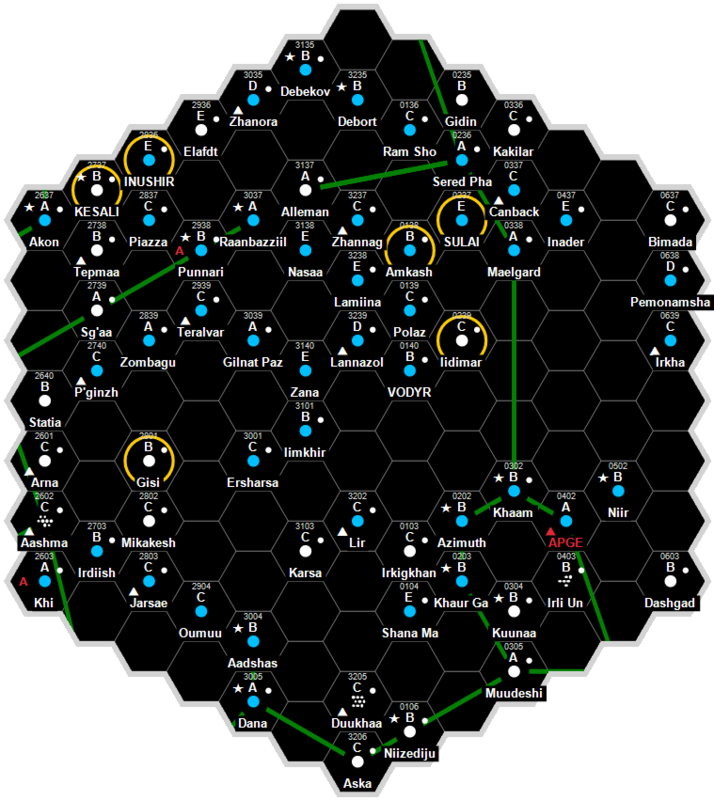 "Domain of Deneb: Sector Data." MegaTraveller Journal 3 (1992): 47-58. Dave Nilsen. The Regency Sourcebook (Game Designers Workshop, 1995), 54. This page was last modified on 13 November 2016, at 15:01.